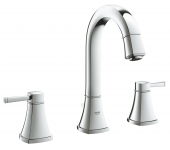 Elegant and extravagant - this is how the Grohe Grandera design line presents itself. In addition to the possibility of combining chrome with elegant gold, you also have the best of design here. Namely the perfect combination of angular and round forms: slightly rounded surfaces, curved bodies and straight edges that give your bathroom a special extravagance. While Grandera always remains faithful to its line, the product series still offers a wide variety of forms. You can choose an extravagant bathroom tap to suit your individual needs whether you are looking for a 3-hole tap with a sweeping curved spout or the slightly more straight-lined 1-hole free-standing tap for your washbasin. However, all products have one thing in common: the stylish comfort factor in your bathroom, which results from the flowing shapes of all Grandera faucets. For the washbasin, you can choose between free-standing and wall-mounted faucets. The single-hole stand variant is available in sizes M (175 mm), L (300 mm) and XL (333 mm). The L-size shows itself in a different design than other sizes. This is because it is a two-handle faucet. On both sides of the outlet, there is a handle with the lever pointing upwards. The outlet is bent forward and rounder than the other stand faucets. 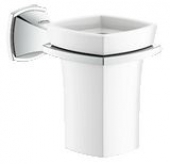 The three-hole basin mixer with L tap outlet is also available as a stand version. These are available in two sizes: 264 mm or 184 mm. 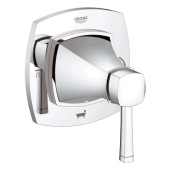 Two-hole and three-hole washbasin mixers are available for wall mounting (both tap lengths of 177 mm or 234 mm). The water jet can be flexibly adjusted with the AquaGuide and adapted to the shape and depth of the washbasin. The selectable outlet size also helps to find the right tap for every washbasin. The lever of the multi-hole faucets is bell-shaped, which underlines the elegance of this type of faucets. For the bidet, the standard faucet is only available in a height of 158 mm. This has a ball-joint outlet which allows the water jet to be adapted to personal preferences and flexibly adjustable. A wide range of faucets are available for the shower. These include thermostat batteries with two-way adjustment for surface-mounting and flush-mounting. A single five-way diverter is also available. The rod-hand-showers and shower bar sets can also be used as an addition. Suitable ceiling and wall brackets are also available for overhead showers as well as shower head holders for hand showers. If you prefer a round hand shower instead of a rod-hand-shower, you can combine these from the Power&Soul series. All shower faucets appear in Squircle form, some implemented a bell-shaped design. As for the shower, thermostats with two-way adjustment are also available for the bathtub. These are equipped either with a rotary handle or with a lever handle, so that everyone can choose their preferred handle. However, the surface-mounted versions are always equipped with the rotary handle (and with an integrated outlet). The highlight of the series is the free-standing bath faucet, which is very elegant due to the mixture of forms and rounded edges. The operation is controlled by a lever handle. Components of the free-standing bath faucet are the stand feet with integrated outlet and faucet, resulting a cross-shaped structure. It also includes a hand shower with shower hose and an automatic diverter for bath/shower. The free-standing bath faucet has a projection of 320 mm. The four-hole or five-hole tub combination in the two-handle or single-lever version is always an eye-catcher in the modern bathroom. This also includes a hand shower and a diverter bath/shower. A bath inlet is also available separately, which can then be combined with the individual valves and batteries of the series. To have the distinctive look of the series in a complete bathroom, the accessories and accessories components of Grandera can also be used. You will find lamps, the EasyReach shower tray for mounting on the bath or shower mixer, toilet brush set, towel rings and various towel holders, soap dispensers, toilet paper holders and mouthwash glasses with holder. All accessories are also in Squircle-Form.